Our Approach & Philosophy: Swing Time brings an innovative and easy-to-learn approach to all levels & styles of swing — the same teaching approach that has made our classes the most popular in the state! We instill the fun, energy, excitement, and magic of dancing in every class we teach and in every event we produce. In addition to teaching people to dance, Swing Time's classes also emphasize social interaction and, most importantly, having fun! Whether you're dancing at a Swing Time event, or at a club, party, dance or concert... anywhere there's music, we want you to be able to dance to it. And we want your partner(s) to love dancing with you! The better your dancing, the more people will ask you to dance! 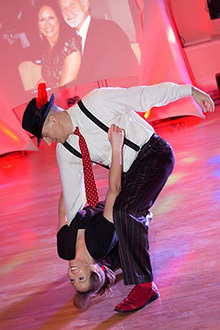 Swing Time promotes a fun & friendly atmosphere at both our classes and our events. Our instructors break seemingly complex dance moves and dance principles into easy-to-digest pieces that you can easily learn. Our approach is based on years of dancing and teaching experience, it's innovative, and it works! Instructor Bio: Sam has 20+ years of partner-dance experience, and is known as an accomplished all-around dancer. To the delight of his partners, he's able to improvise and create dances on the spot to whatever music or band is playing. Sam is an expert at the entire repertoire of swing dances, from East-Coast to Lindy Hop, Balboa, Charleston, Shim Sham, and more. He also enjoys crossing over into other dances, with experience ranging from Ballroom to Blues to Latin to Contra to Zydeco to Fusion! 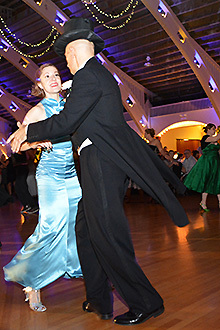 A skilled organizer and instructor, Sam has been organizing dances since 1997 and actively teaching swing dance since 1999. Sam's an innovator who was instrumental in starting and building Tampa Bay's swing scene from scratch. Accomplishments include founding both Swing Gang (1998) and Swing Time (2000), sponsoring Tampa Bay's first-ever Lindy Hop dances (1999), first Lindy Hop Dance Teams (2009, Hit That Jive & Swing Time Dancers), first Blues dance (2010), first Fusion dances (2014), and first two Lindy Exchanges (2013 & 2014). 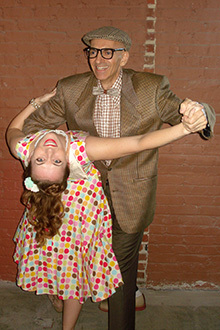 He's taught tens of thousands to dance over the last 18 years, at over 1000 swing dances, special events, festivals, cruises, and dance classes. 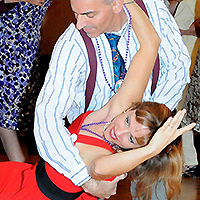 In fact, most of Tampa Bay's elite swing dancers and instructors have passed through the Swing Time ranks in their journey to become better dancers. Sam has traveled all over the USA and Canada, learning, dancing, teaching, and occasionally competing. Noteable past travels include Montreal Swing Riot, Frankie 95 (New York City), Ultimate Lindy Hop Showdown (New Orleans), Beantown Lindy Hop Camp (Boston), All Balboa Weekend (Cleveland), Austin Lindy Exchange, Natural Ball (Atlanta), and Sea Swing Sensation (Caribbean). He's studied with most of the world's top swing dancers, including his greatest inspirations, original Whitey's Lindy Hoppers, Norma Miller and the late great Frankie Manning. Sam has been instructing for Swing Time since the beginning, over eighteen years now! Instructor Bio: Teresa has loved dancing since the very first time someone spun her. Since she started swing dancing ten years ago, Teresa has lived and traveled across the USA, all the while learning and dancing Lindy Hop and Balboa, and teaching upon request...in places that include Los Angeles, Chicago, Las Vegas, Austin, New Orleans for one year, her former home in Phoenix, and last but not least, her new home in Tampa Bay! She enjoys sharing her dance experience and helping people become better dancers. 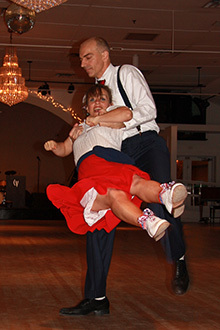 Swing Time offers the most popular and well-attended swing-dance classes in the state of Florida! We've consistently accomplished that since the year 2000. 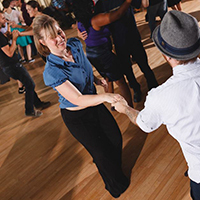 Whether it's a 6-week course, a drop-in class, or a private lesson, Swing Time provides you a step-by-step approach that works in your journey to become a better dancer.